If you are a landowner who depends on a private water supply, you should be paying attention to the current discussion regarding the expansion of drilling along the Beartooth Front. Acting now to protect your water and your rights can avoid heartache later. My primary source for this post is an excellent brochure put out by the Northern Plains Resource Council, which I recommend you download. I’ll be pointing out the key water issues you should be paying attention to. Hydraulic fracturing, or fracking, or horizontal drilling is a non-traditional form of extraction that is extremely water intensive. A single well uses an average of 4.2 million gallons of water per fracturing, a year’s worth for 42,000 people consuming a thousand gallons each. Each well can be fractured up to 10 times over the course of its life. If my math is right, the 50 wells that ECA plans to drill will use 2.1 billion gallons of water if each is fractured 10 times. That’s enough to supply the entire population of the United States for almost a month. by truck from an outside source. This is not a trivial amount — a single well can result in over 2,000 truck runs. If you are willing to accept a well, require a clause allowing a water well in the lease. This is important because Montana code exempts wells flowing 35 gallons per minute or less from regulation. DO NOT negotiate a lease without consulting an attorney. Damage to your water supply or your land could substantially reduce the value of your property. The water used in fracking is treated with chemicals, many of which are toxic. Some of this is left in the ground, but the remains must be disposed. This “flowback” is either pooled on-site in “impoundments,” hardened and buried; or trucked to a disposal site. Drilling proponents will tell you that if fracking water is disposed of properly it won’t harm groundwater, but as we’ve seen all over the country, the reality is an entirely different story. Spills are common, impoundments are sometimes built too close to water supplies, and waste water can seep into the ground even when impoundments are lined. As a property owner, it is absolutely critical to test your water supply BEFORE drilling begins, so you can determine whether there’s been contamination later. If your water supply is damaged, you will need to prove that the damage was caused by the drilling and its aftermath. Without a baseline test you won’t be able to do that. The Pennsylvania Department of Environmental Protection recommends at least these tests. Click to enlarge. the chemicals they use in fracking. You should absolutely consult with an independent professional for advice on this.The Pennsylvania Department of Environmental Protection recommends at least the tests on the left, but you should talk to a professional to determine what is right for you. You can find an example of pricing information here. Who’s going to do the testing? ECA has said in public meetings in Red Lodge that they will do baseline testing within a mile of each drilling site, but there has been no written verification of this. 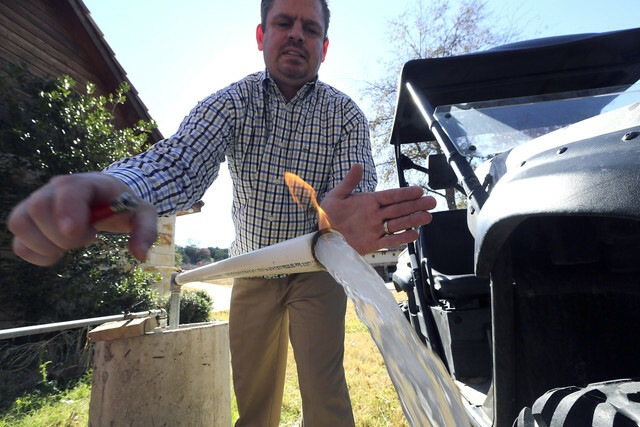 You should be aware that in Texas, the EPA declared that a group of Texas homes near a gas-drilling operation didn’t have dangerous levels of methane in their water, relying on tests conducted by the driller. Since then, independent tests from Duke University researchers have found potentially explosive levels of methane in some of the same wells. I’m sure ECA is a reputable company, but it’s your property. Baseline testing will probably cost a few hundred dollars, so you’ll need to weigh whether to wait to see if ECA will do the test, or do it yourself. Keep in mind also that we have no information from ECA about where they plan to drill and when, so acting soon will make sure you get the testing done before nearby drilling takes place. 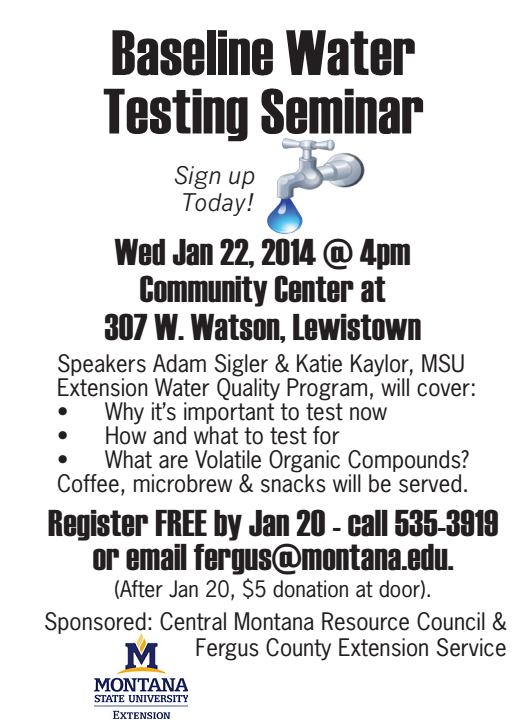 You can find a guide to local independent water testing labs at the Montana State University Extension Office web site, or by calling 406-994-7381.
it would be a worthwhile thing for you and/or your neighbors to do if you’re concerned about protecting your water. If you go and have materials you’d like to share with the community, let me know and I’ll post them here. This event is certainly valuable enough that it would be worth considering doing one in Red Lodge. But don’t wait. You need to be in action now. Aside | This entry was posted in Community Organization, Politics and History, Fracking Information and tagged baseline water testing, Fracking, hydraulic fracturing, Montana State University, Northern Plains Resource Council, wastewater, water contamination, water rights. Bookmark the permalink.
. . . and if you’re a landowner who depends on any seep, stream or river for stock water, “pre-poison” samples, legally collected (certified clean containers containing certified reagent) and legally analyzed (by certified lab within maximun time interval) of that water source is your only leg to stand on: as any Tongue River Basin rancher.